The 2012 World Series of Poker has had a number of highlights; from Phil Hellmuth’s 12th bracelet, to Phil Ivey’s five final tables, to women winning two WSOP bracelets, to Andy Bloch’s first WSOP bracelet, to Mike Mizrachi’s second Poker Players Championship win in the past three years. But despite all of this there has been a certain something lacking in the energy at the Rio and throughout the poker world; the 2012 WSOP has simply lacked the excitement that previous incarnations of the event have seen. That all changed on Sunday July 1, 2012 when 48 players sat down to play a $1,000,000 buy-in tournament called The Big One for One Drop. The hype surrounding this tournament was a mixture of awe and curiosity, and until the first hand of the mega-satellite was dealt on Saturday was dealt nobody really knew what to expect. A second, more exclusive, satellite was also held at the Aria on Saturday. When the Rio satellite attracted nearly 100 players (this was a $25,000 buy-in satellite mind you) it was clear that the Big One tournament was going to be special –made all the more special by Phil Hellmuth and Gus Hansen winning seats into the event. One Drop’s buzz grew to such a fevered pitch that the WSOP decided to live stream every minute of the tournament on their website, and virtually every poker aficionado watched the proceedings, while at the same time lighting up the poker forums with their thoughts and musings on the event. The One Drop tournament may be precisely what poker needs to regain the passion it had in the mid-2000’s when every office and college dorm had regular games. The glamour of million-dollar prizes may have lost its luster (after all how many times can you see someone win $1 million or a WSOP bracelet before it becomes boring?) 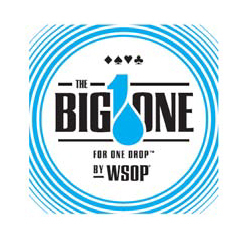 but the sheer magnitude of the One Drop tournament has brought and even wilder side of the game to the forefront. Fans saw Gus Hansen place a $50,000 brick of $100-dollar-bills on the floor under his seat for no apparent reason other than, “where else am I going to put it?” Or Jens “Jeans89” Kyllonen, a 22 year-old online PLO specialist, saying, ”what am I going to do, buy a car, property…..why not gamble?” when asked about putting up the full $1,000,000 buy-in himself. It was clear right from the get-go that this wasn’t simply another poker tournament, or even a gimmick like the hastily thrown together $250k buy-in Super-High-Roller tournaments that have been played at the Aussie Millions over the past two years, One Drop was a different animal, with insanely wealthy men playing poker for insane amounts of money, all the while getting four-hour massages, and looking like the stakes were nothing more than a local $1/$2 NLHE game at the casino. I’m not sure if One Drop is going to be a turning point for poker (the press coverage should be off-the-charts for the final table and winner of the event) but I do know that it will go down as the signature moment of the 2012 WSOP; a WSOP that has had a lot of signature moments already. This entry was posted on Monday, July 2nd, 2012 at 8:31 am and is filed under Poker News. You can follow any responses to this entry through the RSS 2.0 feed. You can leave a response, or trackback from your own site.